This used to work perfectly until a couple of weeks ago. Currently, however, whenever I close and reopen ConEmu, it always reopens on the top-left corner of my main monitor, regardless of where I left it before closing. I've tried several different things to try and pinpoint the root cause -- putting it in a different position in the main monitor, putting it in a different position in the second monitor, enabling and disabling Quake-style slide down, saving the config in an XML file, saving the config in the Registry -- but they all produce the same results: the X position configuration goes back to 0, even though the XML file shows that the value was saved correctly. I can also provide the XML config file, if it helps. Also, I need LogFiles where you run "ConEmu -log", move it to another monitor and close it. After that run "ConEmu -log" again and close it. The log files and the XML config can be found here. Same issue for me after I updated to the latest Alpha (151115) the window position resets every time I reopen ConEmu. Short: negative values won't be saved in DWORD reg keys (ConWnd X). I have a horizontal triple monitor setup running. The primary screen is the centered one, so (0;0) is the top left edge of the centered screen. The top left edge of the left screen (where I want ConEmu to be running at) is (-1920;0). Moving ConEmu to this position and closing it (to update the position in the registry) changes the value of ConWnd X not to -1920 as expected but 0xfffff8ef or rather 4294965487. 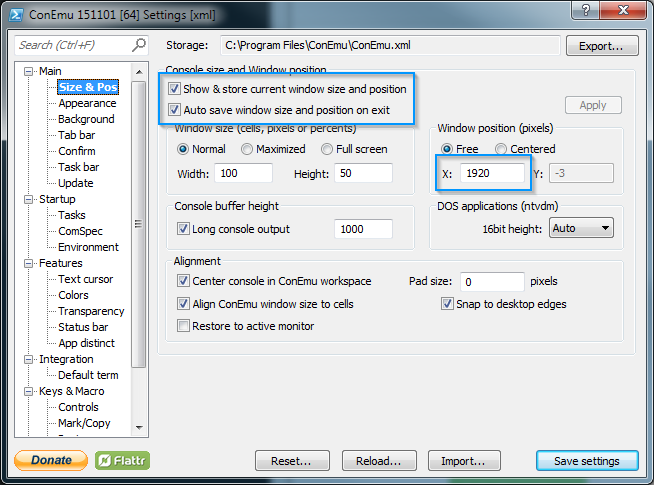 After reopening ConEmu the window will be at the last "valid" position. I'm also not allowed to enter negative values into the X: textbox in the screenshot above. Maybe this is also the case for cobrabr...?! I don't know the version which I run last, but it did work properly in the past! For me (as the screenshot shows), the values that reset aren't negative -- in fact, I'm pretty sure Y remains at -3 (that value is negative in this case because of the Quake-style slide down, I believe). But like @Claw0 said, it used to work in the past -- I've had my ConEmu on my second monitor since the first day of using it, and it always saved the position properly.